When I was a little girl, I knew that every now and then, a magical pot of tea eggs could be found steeping in the fridge. We used to eat these yummy, beautifully marbled eggs as a tasty snack. I never really thought about where they came from or how they were made. Tea eggs or “cha yeep dahn” in Cantonese literally translates to “tea leaf egg”, is a traditional Chinese snack and big metal tubs of tea eggs can be found all over China by way of street venders and market stalls. Easily portable, pre-cracked and already wrapped in a natural casing, tea eggs are a wonderful whole food. The yolks have the grey outer due to being cooked for a time but this in no way affects the flavour. Tea eggs can be eaten hot, warm, at room temperature or cold. If you prefer cold or hot boiled eggs, then proceed as per your preference. 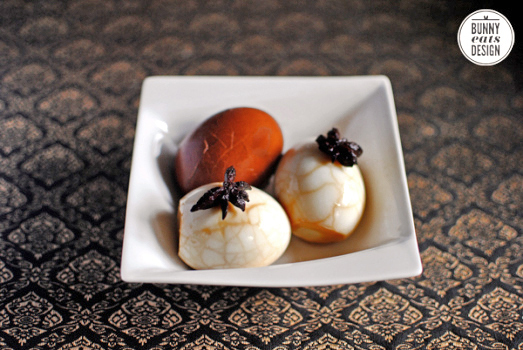 Chinese tea eggs taste mildly salty-sweet, aromatic like aniseed with a good dose of “egginess” of course. Now that I am a grown up, no tea eggs magically appear in my fridge. Our local Chinese grocer sells tea eggs for 50 cents a piece and sometimes if I am shopping while hungry, I will buy an egg to snack on. I’ve always wondered about tea eggs and what made them so yummy. Turns out it’s quite simple. The brew is simply black tea, soy sauce and spices. Traditionally, tea eggs would have been made with free range eggs. Because traditionally, chickens were not factory farmed. Use fresh eggs and as large as you can get. Recipe adapted from Steamy Kitchen’s recipe here. Place eggs in a pot and fill with water to cover eggs plus 1 inch. Bring the pot to the boil and then immediately turn down the heat and simmer for 5 minutes uncovered. You only want to cook the eggs enough so that you can crack the shell without whites running out. Remove eggs from heat, drain water and with cold water. Once eggs are cool enough to handle, gently tap each egg all over the shell. I use a teaspoon or the flat edge of a butter knife. The more you tap, the more intricate the design will be. Personally, I wish I had been a bit more daring with my breaking. Do not break open the eggs, you only want to fracture the outer shell and make sure you keep the membrane/skin intact. Put the eggs back in the pot and add all the other ingredients. Top with hot water so that the eggs are *just* covered. Bring to the boil and then immediately turn down the heat and gently simmer for 10 minutes uncovered. At this stage the eggs are cooked. Allow to cool for a couple of hours, then cover and and refrigerate in stewing liquid for 1-2 days. Remove eggs from stewing liquid after 2 days otherwise the eggs will get too salty. This stewing liquid should be discarded. Eat tea eggs within 1 week though they never last more than a couple of days in our house. If you are a street vendor, keep eggs heated to a comfortable serving temperature (a hot bath) until sold. Great hot or cold. Note: Apparently you can also cook these eggs in a rice cooker which is handy as all Chinese households have a rice cooker. I’ve got a Peter Gordon recipe for these that I’ve been meaning to try for a while. I’ve never actually had one myself, but the idea and the visual look too delicious. No shortage of eggs here. And I’ve always meant to make these. It’s very easy. I wish I’d done it earlier. I had these for the first time for chinese new year and they were amazing! at first they didn’t seem all that exciting but after trying one I wouldn’t mind have eggs like this all the time. they’re so flavorful! Yours looks great! I’ve always had them so it’s hard to imagine what someone unfamiliar with tea eggs would imagine that they taste like. Mild like tea? They’re flavourful without being intense. A yummy snack. I love Twining’s English breakfast tea in the red box :3 will have to try making these soon – I have a jar of star anise that’s been waiting for a cool opportunity like this! I really like this use of star anise as there is no chance of accidentally crunching on one of those things. Nice marbling! I am definitely not as good at tapping my egg shells. 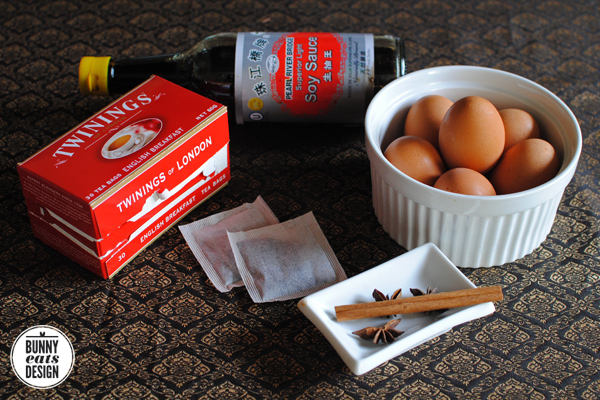 Tea eggs are great because they are so quick to make (unlike, say, salted eggs). Oooh, I just came across this idea for a pretty effect too! Wow those eggs are very intricate and beautiful! Very pretty and aptly timed. I’ll be making hot cross buns this afternoon! Happy Easter to you and the Koala; give Tofu a big hug and kiss for me! Thank you Eva. I hope you enjoyed your hot cross buns! We bought some buns this year and piled them on a big platter, hot and buttered and shared them with lots of friends. Hi Genie, I decided not to make the buns after all, and it’s just as well, we had so much food! We had a mega eating weekend too. We’ve been sharing food communally for the last 3 days. It’s been lovely and fun to cook with lots of people. I think we generally panic when we know that shops are closed for a day and over estimate what we need in terms of food. Lovely. Glad to have found this darling blog. I will definately be back. Your pictures are beautiful. Thanks Chef Connie. Looking out to checking out your blog too. Hi Raymund! Your eggs look great. I was a bit timid with my egg cracking but I know for next time.